The IALA World-Wide Academy delivered its first formal one-week Level 1 AtoN manager Module 3 course in its Headquarters from 3 to 9 April 2017. 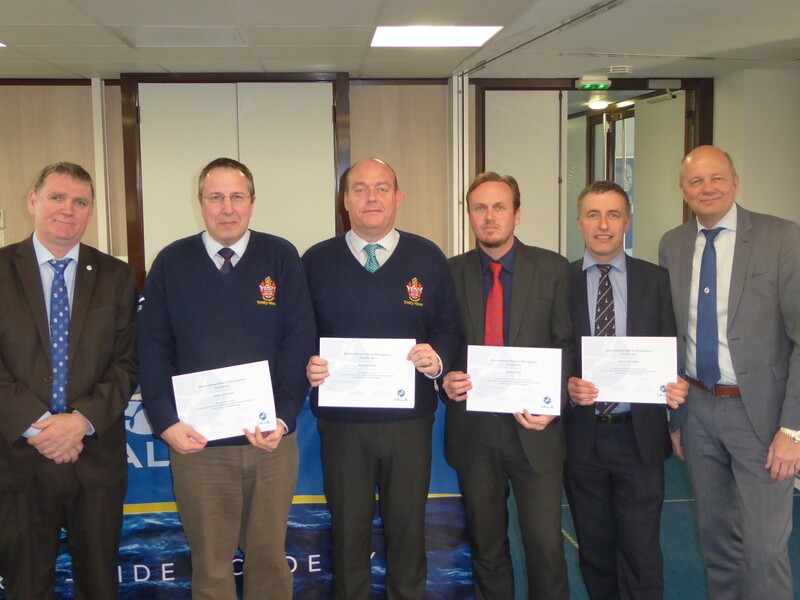 The course was attended by four participants; 2 from Trinity House Lighthouse Service (THLS – Mr Peter Douglas and Mr Robert Dale) and one each from the Northern Lighthouse Board (NLB – Mr Peter Douglas) and a Singapore/Philippines-based private company (M-NAV Solutions – Mr. Adam Hay). All four experienced participants had completed successfully the “proof-of-concept” distance learning courses for Modules 1, 2, 4 and 5 which started in June 2016. Module 3 comprises 12 lectures delivered using PowerPoint presentations supported by 4 group-based exercises and a major 2-day planning task. The core activity was completed by noon on Day 3 and the participants elected to sit the theoretical test of competence that afternoon. Interventions and examples from their own experiences contributed significantly to the conduct of the course. Feedback from all of them was that the course content was both valuable and well-delivered and they left feeling empowered to enhance AtoN service delivery and management in their respective work-places. International certificates of competency were presented by the Dean at an award ceremony overseen by the Secretary-General and attended by members of the PAP Committee. Two participants (Mr. Douglas and Mr. Hay) gained first class passes. Mr. Dale, who had no maritime background, was awarded the best student certificate. The introduction of a major planning task was incorporated into the standard syllabus for the L1 course delivered by the Academy in 2016. The aim was to consolidate the theoretical competency gained during the 5 modules by acting as the national Competent Authority of a developing coastal State – in this case Sudan. The group were given all relevant charts and nautical publications necessary to determine the optimum suite of AtoN in a designated zone based on the volume of traffic and degree of risk. Risk analysis was conducted successfully using the MS Excel-based simplified risk tool which is currently being developed by the ARM Committee. A very impressive Operational Plan, Levels of Service and Operational Performance Statement were produced. The task ended with a PowerPoint presentation to the “Minister of Transport” – the Dean – on the last day of the course. Since the Academy’s first course was delivered in 2014, it has now certified 47 Level 1 AtoN managers, 5 through the blended distance learning programme. Another 14 have completed one or two modular courses. The total number of certified AtoN managers is expected to rise to 53 by the end of this year. To this must be added the existing successful participants on the French, Spanish and Chinese courses and potential participants from the courses planned for Suriname, Korea and China in 2017 – some 75 more. Three years ago, there were just four L1 certificate holders issued under the “Grandfather Clause”. By the end of 2017 year there should be over 130.